Mark Davis has turned the Raiders around not only on the field of play but also in the eyes of the NFL. By taking the team to Las Vegas he may also be turning his own finances around and lining himself up to become an unexpected billionaire. Having inherited a controlling interest in the Raiders in 2011 from his father, Al Davis, along with his Mother, Mark took day to day control. Since then there has been much speculation about the apparent lack of finances available to the team with many suggesting that the Davises might sell the team completely. With the team not reaching the playoffs since 2002, a revolving door of average-to-poor coaches and playing staff and a home stadium that really should be condemned, the outlook for Mark and the Raiders was bleak. Then came the turnaround. General Manager Reggie McKenzie became the architect of a winning team almost out of nowhere. By firing Dennis Allen in favour of Jack del Rio, putting together two good drafts with Derek Carr, Khalil Mack and Amari Cooper amongst them, and some smart acquisition in free agency, the team has been rejuvenated. 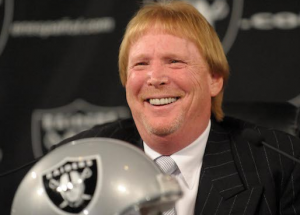 The master-stroke off the field, though, has been Mark Davis’ handling of the business. First of all he changed the NFLs opinion of the Raiders by repaying a circa $50 million debt owed to the NFL for the sale of personal seat licenses at the Coliseum in Oakland. Secondly, after a while, the NFL has realised Mark isn’t as abrasive as his father. Indeed, luminaries such as the hugely influential Robert Kraft of the Patriots has been quoted as saying “he’s become a good partner of the league”, Also, Commissioner Goodall has been impressed by Mark Davis’ lack of complaint when the league voted against the Raiders return to Los Angeles. Both of which could explain why the NFL seems to be getting behind the move to Vegas. And there’s the rub. With a winning team and a move to Vegas, the Raiders could become one of the most valuable sports franchises out there.